-- Select a Size/Color -- 8"-12" - Out of Stock! Make your cat look paw-sitively precious with our Casual Kitty™ Two-Tone Pawprint Cat Collar in Black. 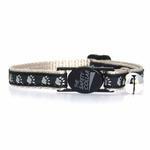 Our Casual Kitty Two Tone Pawprint Cat Collars are made from durable nylon with a decorative pawprint ribbon overlay. Collars feature breakaway buckles for safety and dyed to match jingle bells for location awareness. Great collar for a great price! Posted On 12/26/15 by Colleen M from MERRILLVILLE, IN Yes, Colleen M recommends this product! I bought this collar for my cat after he got out of his other one. This one seems like it will stay where you tighten it and it won't be as easy for him to slip out of it! It is also fashionable and looks great on him! I'm so pleased I found this collar! Posted On 07/09/15 by Janet A from East Norwich, NY Yes, Janet A recommends this product! I like these type of cat collars because not only are they adjustable to fit my cat's neck,but if he gets caught in a tree branch or in a bush,the collar just opens up and he can free himself in an instant if he has to. I also like the fact that it has a little bell on it, and since he is an indoor,outdoor cat, it makes it easier to hear him coming home at night especially if it's late.